"For the first time in my life I'm proud of my country." 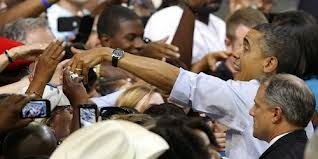 Barack HUSSEIN Obama...America's first 'supposedly' black president...a man who many held high hopes for as being the bridge between the races has proven to be NOT a bridge but a swirling tornado of racial divide and hatred...so much so that he has made racism in America an excuse to be used as a way to escape personal responsibility of all kinds. And under this president the race card resurfaces any and every time a black liberal 'supposed' leader is criticized, when any Democrat is criticized, when Obama's many economic and foreign policy failures are criticized, and when it's needed simply to stir up racial tensions. And liberals relish in claiming that America as a whole is a racist nation simply because they say it's a racist nation...never mind that we have a 'supposedly' black President, a black Attorney General, and 43 black members in the House of Representatives and one in the Senate...none of whom could have been elected without a substantial number of white 'anything but racist' Americans supporting them. And like sheep to the slaughter the overwhelming number of blacks in America continue to support Barack HUSSEIN Obama just because he has dark skin NEVER minding that he has done NOTHING to help them out of the cycle of poverty that seems to dog generation after generation of blacks...NEVER minding that he has done NOTHING to help them get off the government teat. When he ran for president, Obama made countless promises to black Americans...promises he NEVER intended to keep...promises just so they would vote for him. After all his skin color matched theirs...but once in office their lot in life has remained the same or for many has gotten even worse, because now through his actions or lack thereof...through his words of hate...the scabs of long healed racial wounds have been ripped open to bleed raw once again. And this was calculatingly intended, oh so wanted, and heralded by the left. But none of that matters for many in the black community are just happy to have a 'supposedly' black president, and for them Barack HUSSEIN Obama can do NO wrong. Never mind that the black unemployment rate is double that of white Americans...never mind that 27+% of black Americans live in poverty...never mind that according to the latest census 26.4% of households who actually report (many do NOT) receiving food stamps are blacks even though blacks make up only a mere 13% of the American population...never mind that only 63.5% of black students graduate from high school...never mind any of that for Obama's skin being dark is all that matters to many of color...sadly to most but thankfully NOT to all. And with black America currently NOT being a viable force in America's economic recovery what with the rise of newly emerging economic powers in both Asia and Africa, and as white America is losing patience with those who are NOT carrying their own weight...with those wanting what we have but who do NOT want to work for it...the downward economic and social spiral of black Americans continues. And this is somewhat of a conundrum as there are men and women of color who have risen out of the black downward spiral who embrace conservative values and ideals yet whom black community leaders across America insist on calling 'Uncle Tom's' or worse...black men and women who through hard work, focus, and dedication have attained the American dream...throwing off the very 'chains' the black leaders themselves had encased them in. 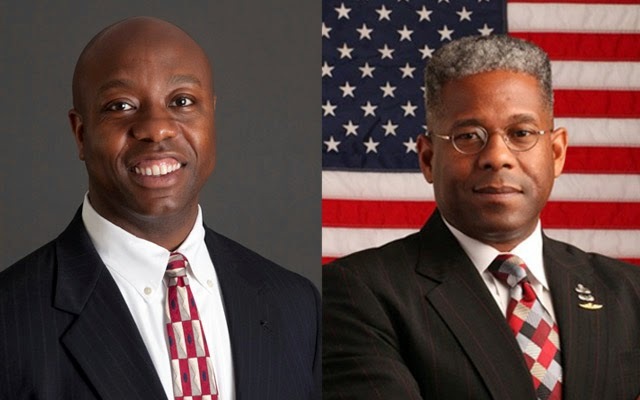 Men and women like former Congressman LTC Allen West, former presidential candidate Herman Cain, South Carolina Senator Tim Scott, Dr. Ben Carson, former Secretary of State Condeleeza Rice, and Congressional hopeful Mia Love...all who have made it...all who did NOT think they were 'owed' something...all who knew the importance of education...all who have put their race in the background moving their ideologies...their beliefs...their values and vision for America into the forefront ...as it should be...instead of playing the race card to win solely based upon the color of their skin. And white America...conservative America...embraces them NOT even noticing the color of their skin. And to those like Jesse Jackson, Al Sharpton, Louis Farrakham, Eric Holder, Elijah Cummings, Alcee Hastings, Shelia Jackson Lee, and of course half-black Barack HUSSEIN Obama...being black...playing the black victim...is the sole way they can justify their miserable, hateful, bigoted existence. Even though they're successful at playing the victim it's obvious they'd trade it all in a heartbeat to be white, but if truth be told they'd fail at being white as much as they fail at being black...for their failures in credibility and honorability are NOT because of their skin color but because of who they are inside. 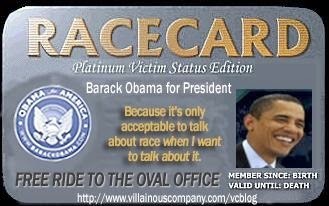 These aforementioned men and women have so played the race card...the victim card...screamed the 'hate whitey' rant for so long that they've tainted the opportunity for true black conservatives to really shine without their own race turning against them...tainted it so bad that America might NOT see another black president for 20 or more years...for a generation. And that would be sad for there are many of color who would honor our Constitution and all it stands for unlike the man who currently holds the office and those liberal white Americans who worship at his feet simply because they think supporting him shows they are NOT racists. Hate to tell them but it does NOT show they are NOT racists...all it shows is that they have bought into the media created myth of Barack HUSSEIN Obama being the 'savior' of us all. 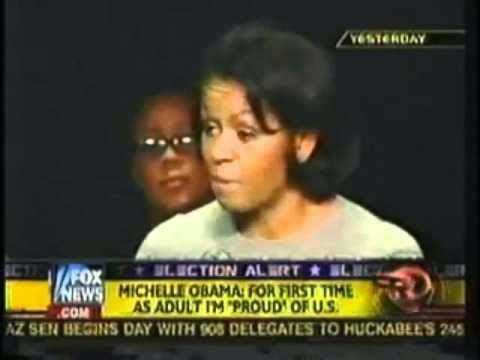 And like Michelle finally being proud of her country...that above all else that is the saddest thing of all...period. The phenomenon of many black people decrying other black people for wanting to learn, be productive members of society and even aspiring to higher goals like public office to help make our country better is NOT new and not a result of the current president, as much as I would like to blame him for that. It has been going on a very long time. In the mid 90's, long before Obama, there was a wave of attacks against black students (high school primarily) by other black people, simply because these were bright, focused students who WANTED to learn, who WANTED to do something with their lives. They were accused of trying to be 'white' and turning against their own people. What you are talking about is simply an exacerbated symptom of a much bigger and more long-standing problem that is being fed by the likes of those you mentioned. I agree with everything that has been said...even the comments section! I think the black community is broken and needs to be fixed; however, much of that fixing must be done by blacks. They simply can't expect white people to do everything for them. I personally like some black people better than some white people, but generally, their community has some major problems ahead. I have a co-worker who is black and I like his personality better than anyone else where I work. I don't know...maybe we just understand each other's jokes! However, this guy is sadly not the norm! In the inner cities many black youth are running amok. I suggest reading "White girl bleed a lot." There is a war against white people by the democrat party, and a sizable portion of the black population. Daily I read of the assault of white people by hoodlum black youth. These assaults should be classified as hate crimes, but the media covers them up (except for the Drudge Report.) Obama was quick to run to the aid of Trayvon and Professor Gates, but not the white baby who was shot point blank in the face by a hood rat. WND. com is good about highlighting these crimes; as is New Nation News. If this trend continues, there will be trouble. I can tell you, white people only have so much patience before they start taking action (if the law won't). A woman and eight teenage girls beat up a white family in Memphis today (or yesterday)...I just read about it today. These white people now fear for their lives! Racial hate is real! I do like SOME black people, but the good are in the minority. To be honest, if the entire lot were somehow transported to Africa, our crime would go down by more than half. We could walk the streets again! In the cities we can't because of urban blacks and their hood rat mentality. I can tell you...whites are getting fed up with this behaviour. The democrats better get them in line since they are the only group blacks will listen to (how unfortunate for them.) The democrats don't care one bit about blacks, or their unemployment, or anything. They use blacks for a power grab. Unfortunately, their votes do count! Originally Abe Lincoln was against giving them the vote, or having them serve on juries. Was he wrong? They think like a hive! Obama is their queen bee, and they follow his orders. We see what their vote has done to cities like Detroit! They live for the minute, and don't have enough sense to understand what is bad for them.